To answer this question, I would be doing a post-mortem on IJMP, revisiting its fundamentals to find clues of its fall in stock prices. It is unusual for a stock that has good fundamental qualities to experience more than 50% dip in stock price over a short span of time. This comes from my own studies and observations of stock price patterns in relation to its financial performances. Therefore, here are 10 things to know about IJMP before you invest. 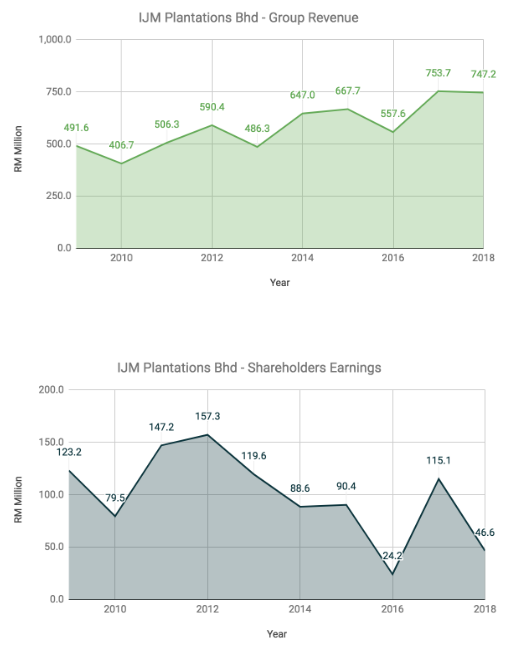 IJMP has maintained the size of its plantation estate at 25,000 – 26,000 hectares for the last 10 years. It also operates 4 palm oil mills that have a total milling capacity of 180 metric tonnes (MT) of fresh fruit bunches (FFB) per hour. Most of its operations are located at the Eastern part of Sabah presently. For the last 10 years, its production of FFB has gradually declined from 600,205 MT in 2009 to 464,019 MT in 2018. 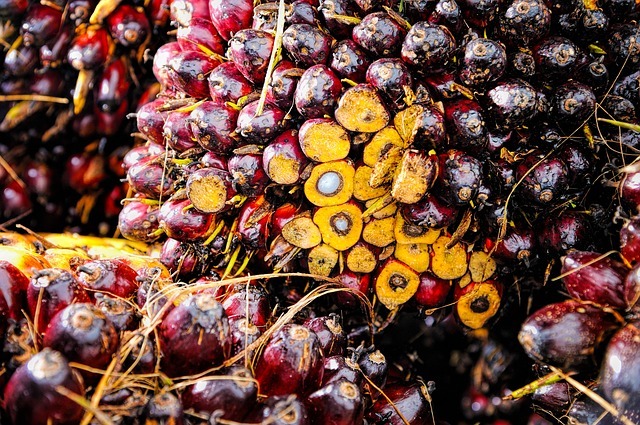 It caused a gradual drop in production of crude palm oil (CPO) during the period. 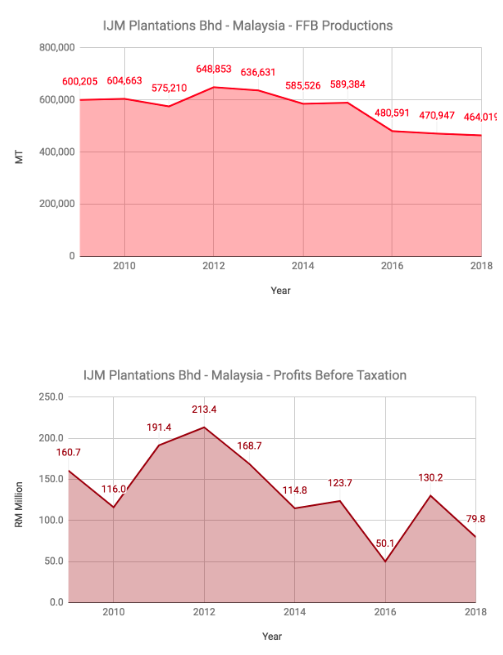 Thus, it caused a continuous decline in profits before taxation (PBT) to IJMP’s operations in Malaysia. IJMP has expanded the size of its plantation estates from 308 hectares in 2009 to 35,831 hectares in 2018. It also has two palm oil mills which has a total milling capacity of 120 MT of FFB per hour. These assets are situated in East Kalimantan. Its estates in Indonesia had begun to mature gradually, thus, increasing FFB production to as much as 400,000 MT per year for the past 3 years. It has substantially grown production of CPO and palm kernel (PK) over the last 10 years. 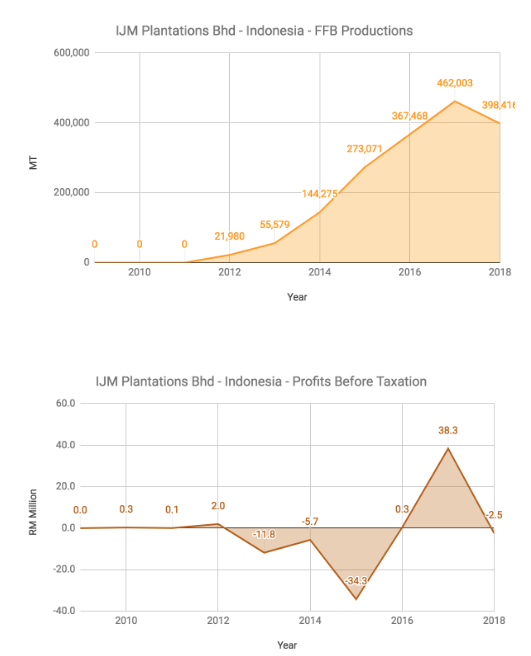 Despite encouraging production results, its Indonesia operations have yet to contribute positively to IJMP with inconsistency in PBT recorded throughout the last 10 years. IJMP has reported gradual increase in revenues from RM 491.6 million in 2009 to RM 747.2 million in 2018. It is in line with higher production figures contributed from its Indonesian assets. However, IJMP incurred higher expenses due to replanting activities, a hike in minimum wages, lower palm prices, and foreign exchange losses arising from an ongoing fall in Rupiah against the US Dollar which impacted IJMP as it has debts denominated in the US Dollar. It caused a fall in shareholders’ earnings from RM 123.2 million in 2009 to RM 46.6 million in 2018. Its return on equity (ROE) has fallen from 14.82% in 2009 to 2.87% in 2018. As at 30 September 2018, IJMP has non-current liabilities of RM 460.7 million and thus, having a gearing ratio of 35.2%. It has current ratio of 0.67. 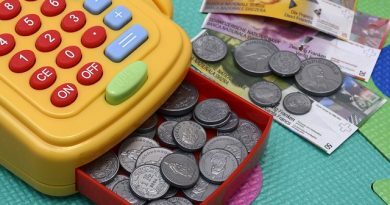 It means, its current assets is sufficient to pay 8 months worth of current liabilities presently. IJMP is in the midst of constructing a new palm oil mill in Indonesia. It has a milling capacity of 60 MT of FFB per hour. The mill is expected to be commissioned in 2019. On 26 March 2018, IJMP has entered into a shareholders agreement to acquire 20% shareholdings of PT PSS for RM 13 million. PT PSS is a joint venture vehicle set up to build, own and operate an integrated oil palm refinery in Indonesia. As at 31 March 2018, IJMP has a weighted average age of 6.8 years for its Indonesia estates. Growth in productions would contributed from it as its plants continue to mature in the future. IJMP has incurred RM 27.5 million in shareholders’ losses over the past 12 months. It is not possible to calculate its latest P/E Ratio as IJMP has no earnings for the last 12 months. As at 30 September 2018, IJMP has reported net assets of RM 1.49 per share. Thus, its current P/B Ratio is 1.01, which is the lowest P/B Ratio ever recorded in the 10-year period. In 2018, IJMP has declared and paid out 5.0 sen in dividends per share (DPS). Hence, if IJMP is able to maintain its DPS at 5.0 sen in 2019 and years beyond, its dividend yield is 3.33% per annum. 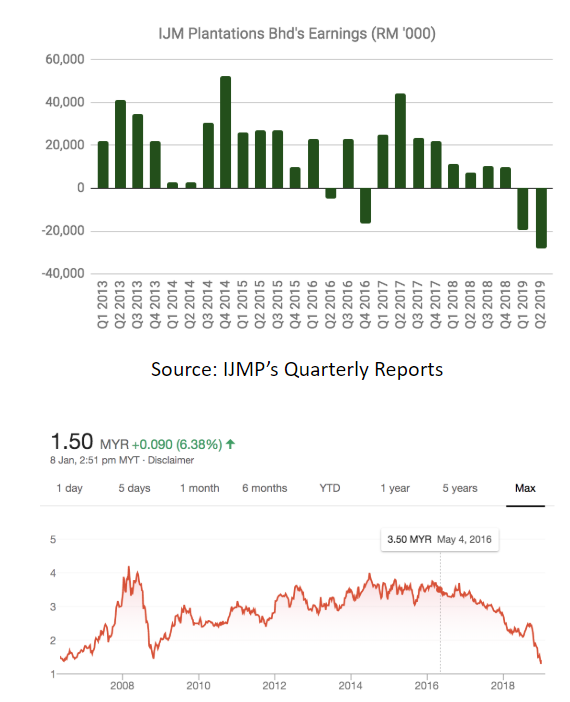 Evidently, IJMP’s fall in stock price has mirrored its continuous drop in earnings especially over the last 8 quarters from Q2 2017 to Q2 2019. Don’t they tally one another? Hence, it is a classic example of a drop in profits that had led to its fall in stock prices. A drop in stock price, like IJMP, does not necessarily mean that stock has become cheap and undervalued. In this case, evaluation of IJMP in terms of P/E Ratio is not possible as it had incurred losses over the last 12 months. It is best to look first at a stock’s fundamental quality before looking at its stock price. There are two benefits from it. 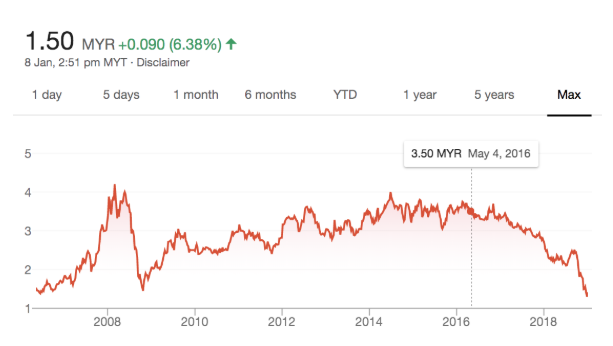 First, investors who have studied IJMP’s fundamentals would avoid investing in it when its prices were at RM 3.50 – 3.70 levels in 2016 due to its inconsistency in results. Second, investors would also have avoided investment in IJMP as its financial results have deteriorated over the last 2 years. Thus, investors would have avoided a potential ‘Value Trap’ in their investment. 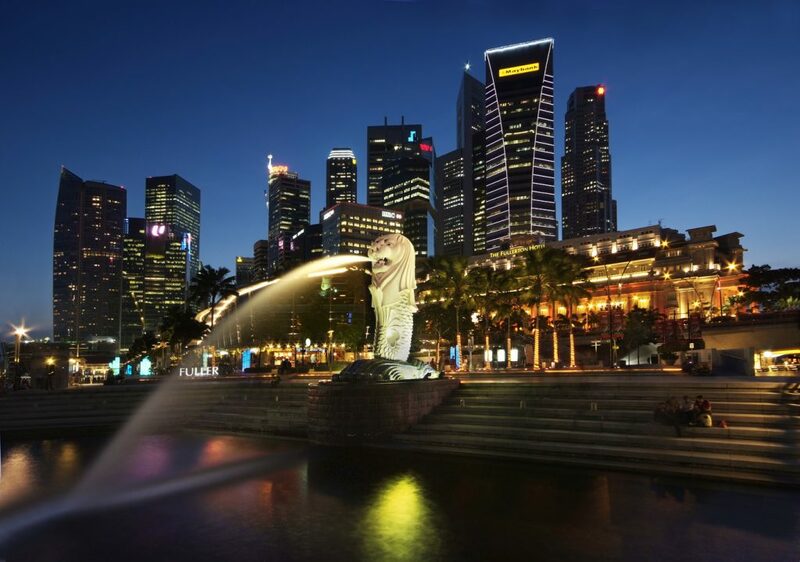 There are 900+ stocks listed on Bursa Malaysia and another 700+ more listed on the SGX. From them, there are many stocks, perhaps 5% -10% of them, have the track record for delivering superior financial results for the long-term. So, why do we need to speculate on the stock market if we can safely enjoy consistent profits from investing in stocks which have great fundamental qualities? ← Can Japan Foods Holdings Ltd Be The Next Mega-Chain? 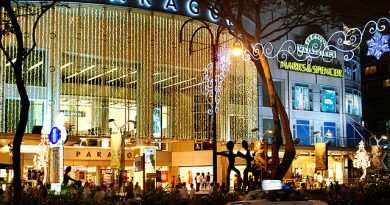 Is SPH REIT Worth Investing In?